As discussed in detail in Bull or Bear (5/24/13), the May high is likely one of the last three logical termination points of the Hope Rally before one should emphasize a larger degree bullish interpretation. We illustrate these three logical termination points with blue arrows in Chart 1. 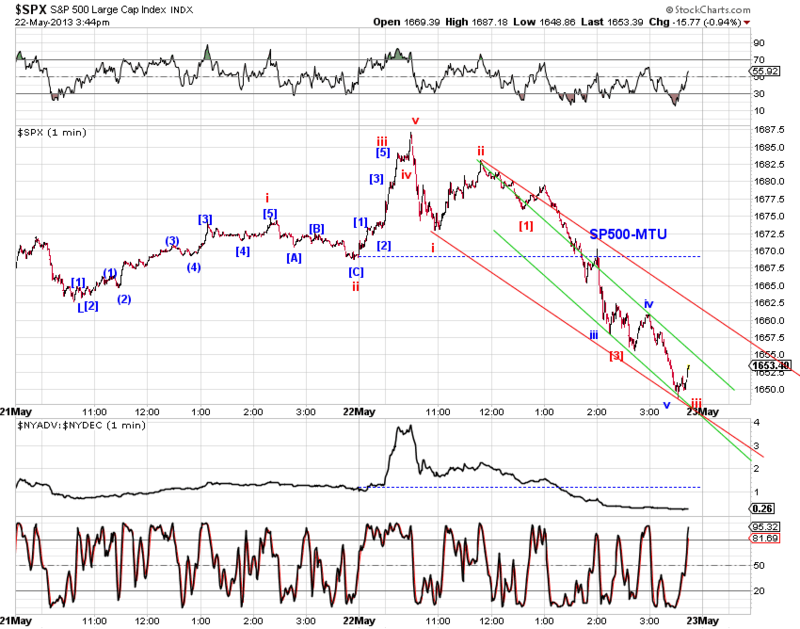 Please see Bull or Bear (5/24/13) for additional analysis. 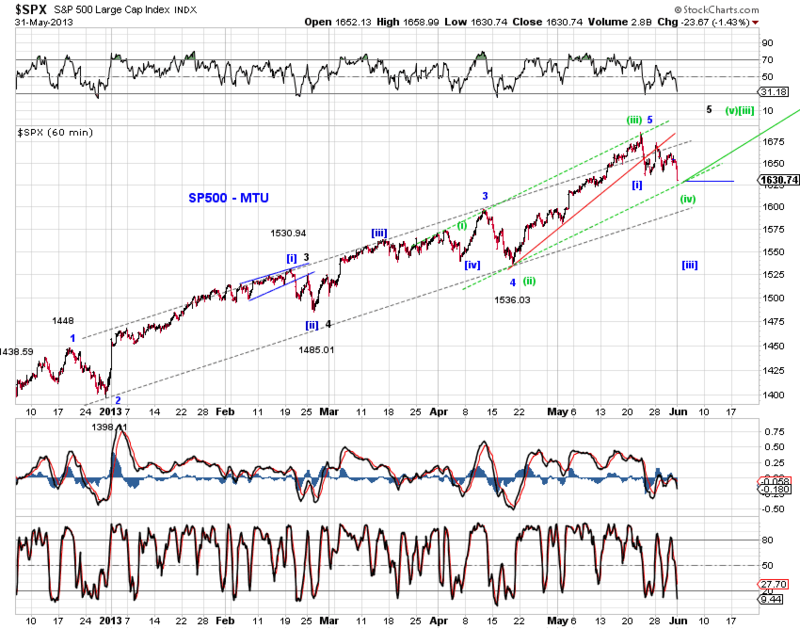 SP500 is approaching a small-degree wave [iv] support if the current sell-off is wave [iv] (Chart 2, green). 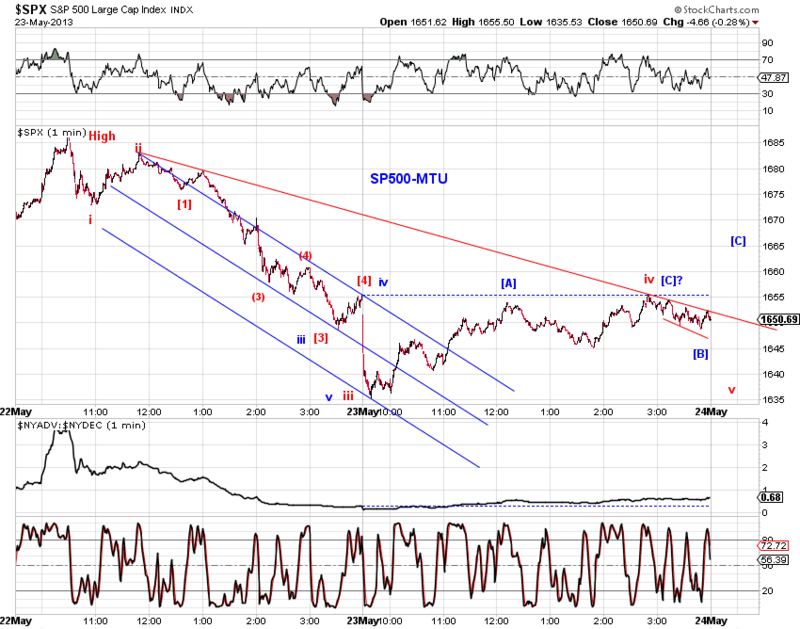 Under this interpretation, the sell-off since the May high counts as a double three or a flat (Chart 3). 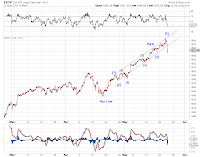 If the May high is a larger degree top (either the blue (3) or the red (5) in Chart 1), SP500 should quickly sell off to show the might of a small-degree 3rd wave decline (e.g. blue [iii] in Chart 2). 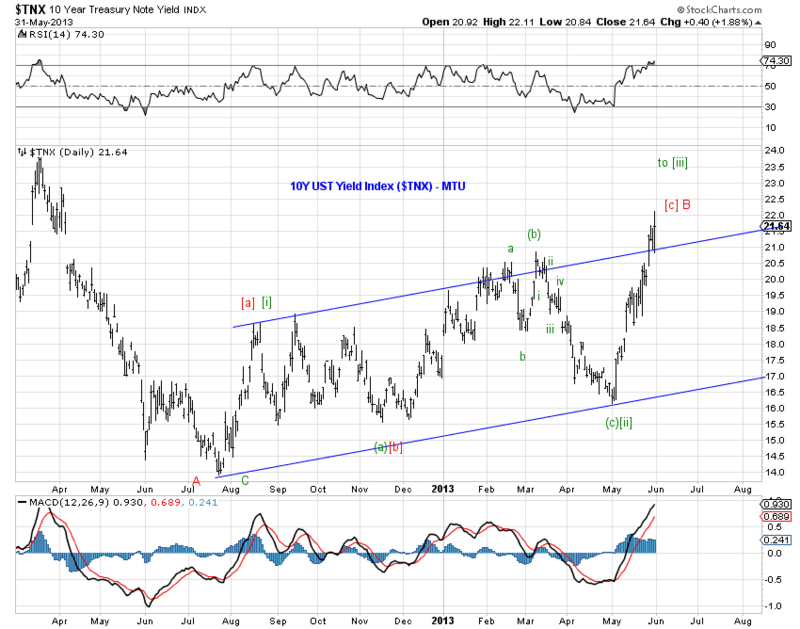 We continue to focus on the 10-year U.S. Treasury yield. 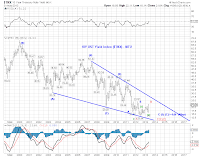 Our tracking counts suggest that 10Y yield either bottomed at the 2012 low (Chart 4, green) or the current sell-off (rise in yield) is only a consolidation within the last leg of a larger ending diagonal triangle (Chart 4, red, B-up of (E)-down). Chart 5 presents our tracking counts on 10Y yields since the 2012 low. 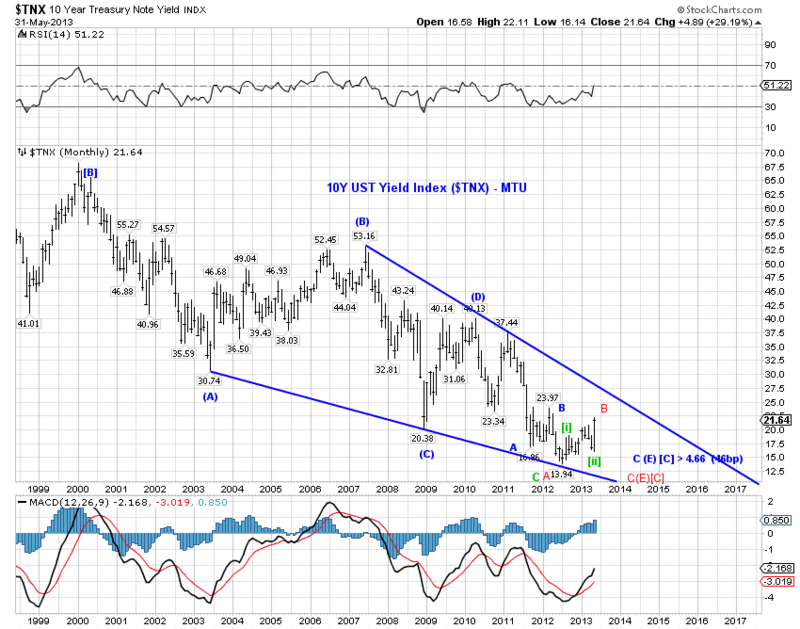 The sell-off in 10Y UST since then is so far a three-wave structure in the form of impulse-expanded flat-impulse. 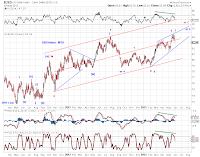 There's no change in the large wave structure of the USD index, except that we decided to move wave [c] of the blue bearish triangle and wave [d] of the green bullish triangle to around the current high for better form. See Chart 6. Chart 7 presents the tracking counts since the 2011 low. 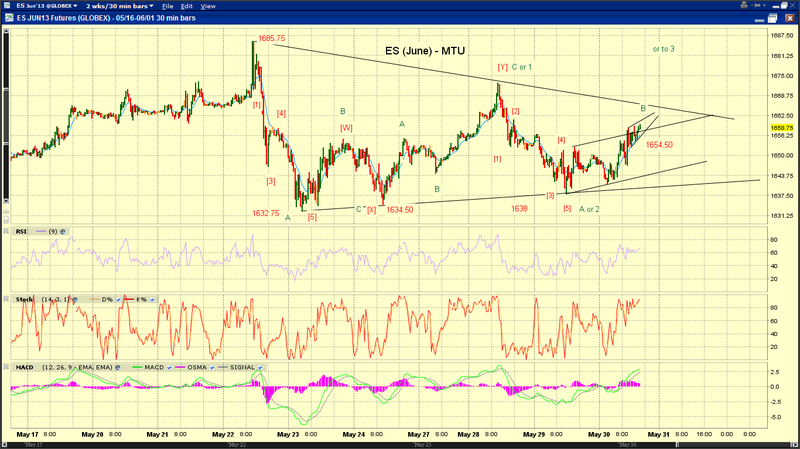 The red count suggests a triple three, which accommodates the larger triangle counts highlighted above. The blue count tracks a regular five which accommodates the black upward flat in Chart 6. 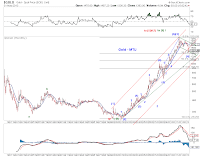 The primary tracking count on gold is a fourth wave pullback (Chart 8) as discussed before. 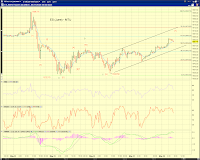 The proposed pullback is currently around a fib-0.382 retrace and approaching its 2-year anniversary. 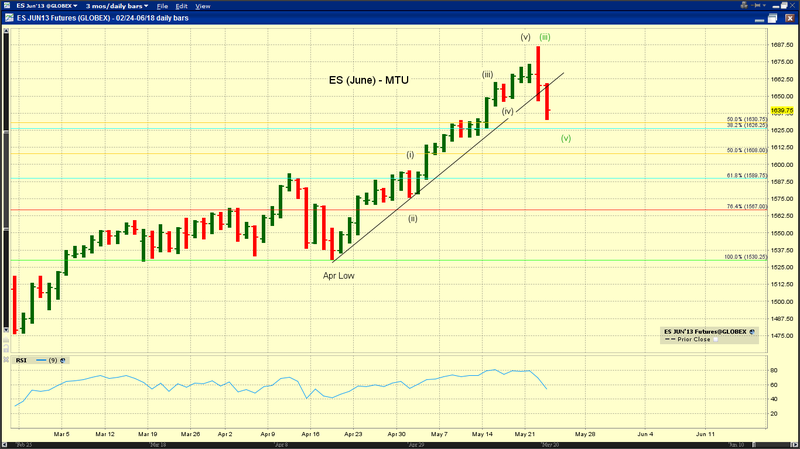 The proposed retest of the April low discussed in Monthly Outlook Update (4/26/13) did play out. Chart 9 presents near term tracking counts as we anticipate the end of the proposed fourth wave pullback which has likely taken the shape of a flat. 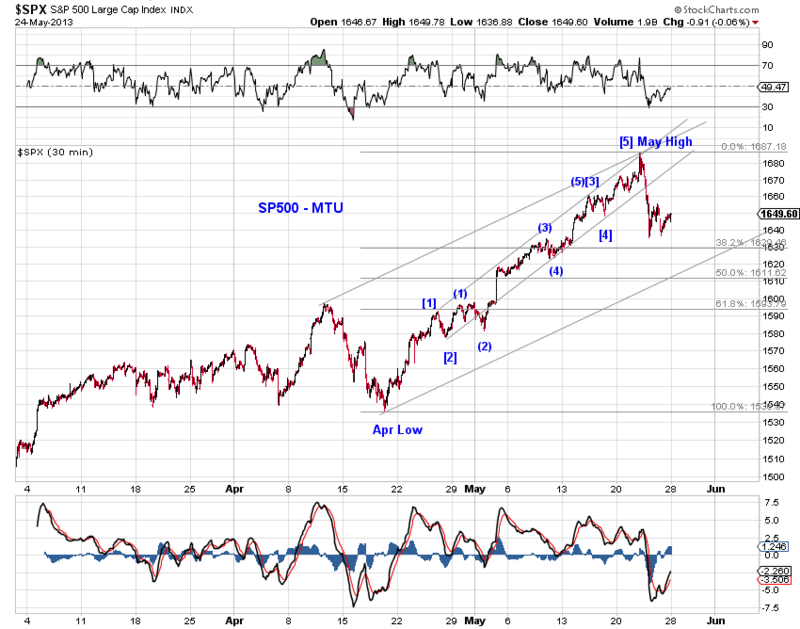 Depending on which small-degree wave is extending or no extension at all, potential support levels are around the April low and 1100. 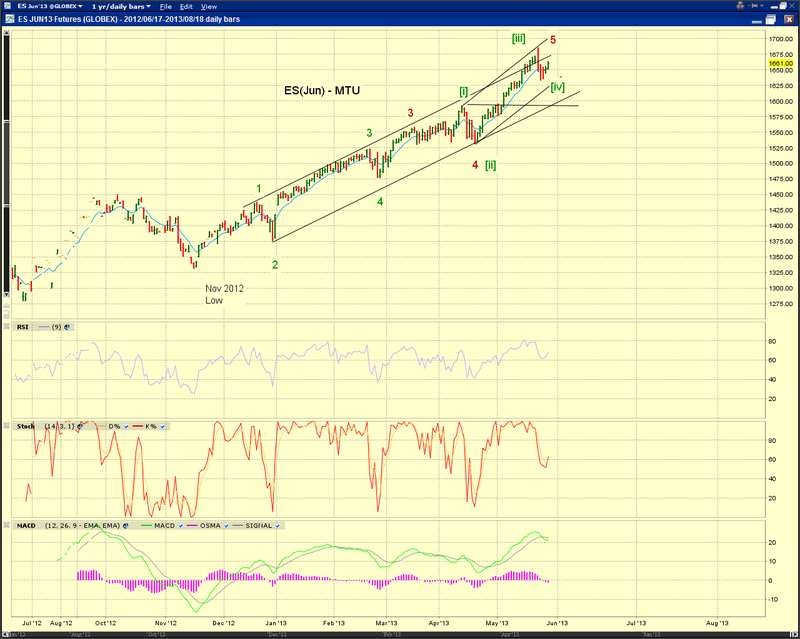 [red - extended wave 3] Wave 3-down from the 2012 high is in progress. 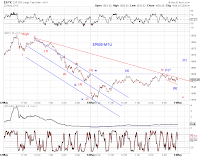 The market is only at wave [iii]-down of 3-down. 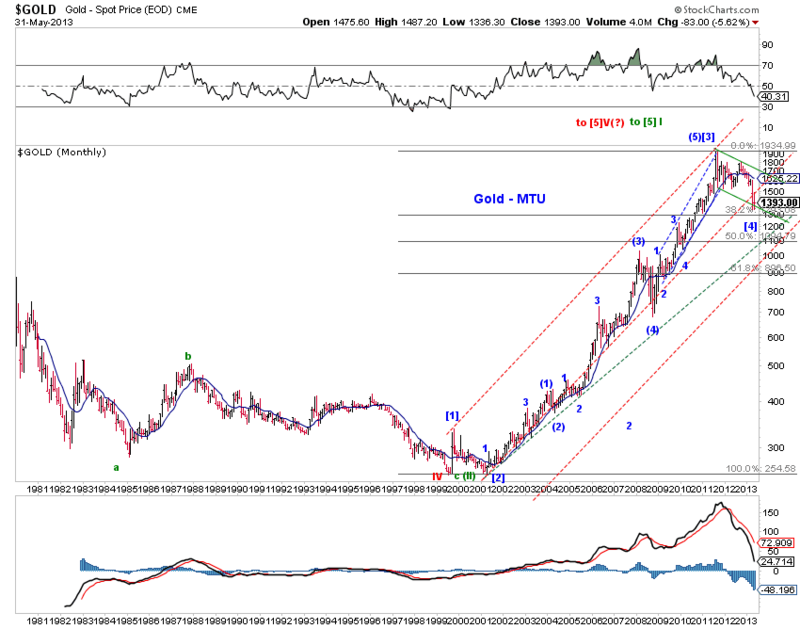 Gold price is heading toward 1100 as wave (C)-down unfolds. 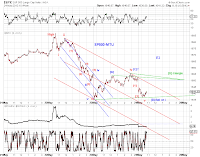 [blue - no extension] The pullback is effectively over at the April low, with a minor breach of that low still a possibility. 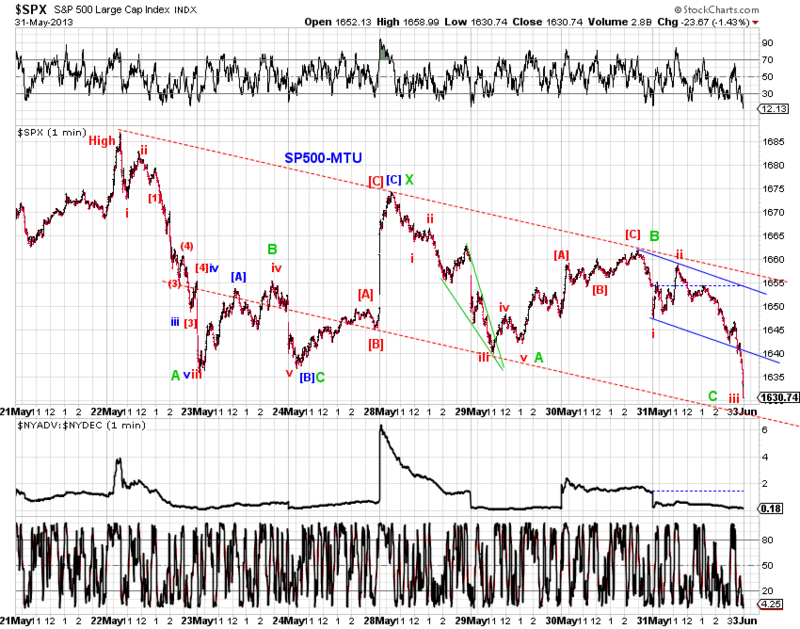 [blue alt - extended wave 5] Wave 5-down from the 2012 high is in progress, but is extending toward 1100. 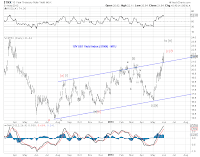 The Tokyo Nikkei Average has experienced a frenzied monetary-policy-induced upswing. 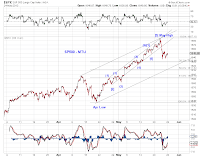 The performance chase came to an abrupt halt in May and the Tokyo Nikkei Average is now down about 15% from its recent peak and is back inside its long term bearish channel. 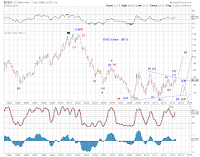 Note that the May peak ran up against major resistance as it conveniently hit a 17-year trend line which connects three major tops in 1996, 2000 and 2007 (Chart 10, red trend line). 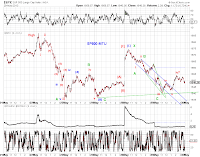 It often takes major effort to breach such major resistance. 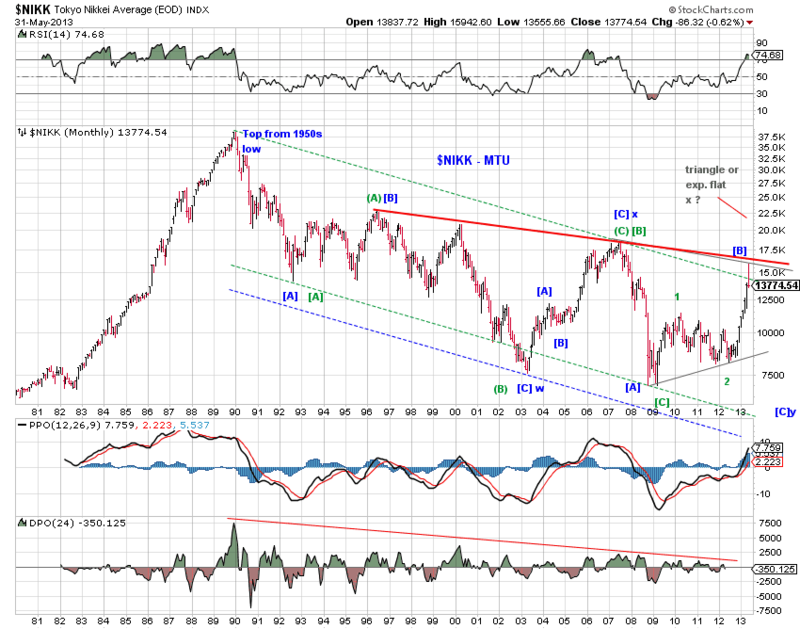 Chart 10 also presents long term tracking counts on Nikkei since its 1980s top, which are straightforward. 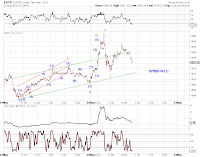 [blue - immediately bearish] The current sell-off marks the beginning of the last wave [C]-down of a large [A][B][C]-x-[A][B][C] bear market. It’s probable that the ultimate low can truncate but it is certainly not required and premature to forecast. [green - bullish] The bear market was over at the 2009 low in a [A]-expanded flat [B]-[C] structure. 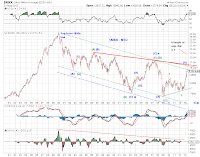 Nikkei is subdividing higher (potentially in a series of 1s and 2s) in a new bull market. 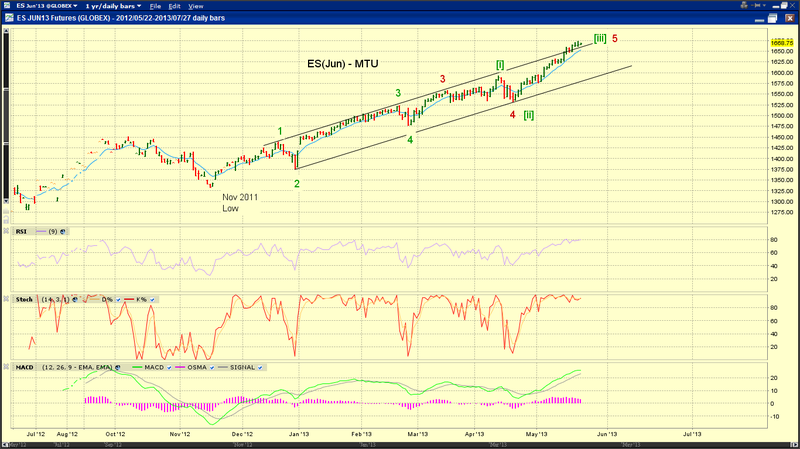 However, for the bullish count to track, the major resistance around the May high needs to be taken out. 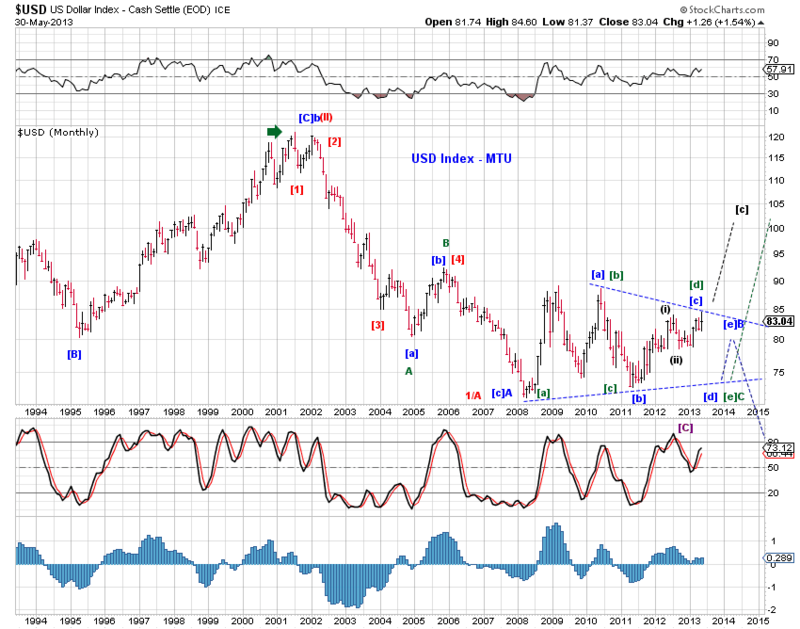 [gray - lengthy consolidation and eventually bearish] Nikkei is tracing out a triangle or expanded flat since its 2003 low. 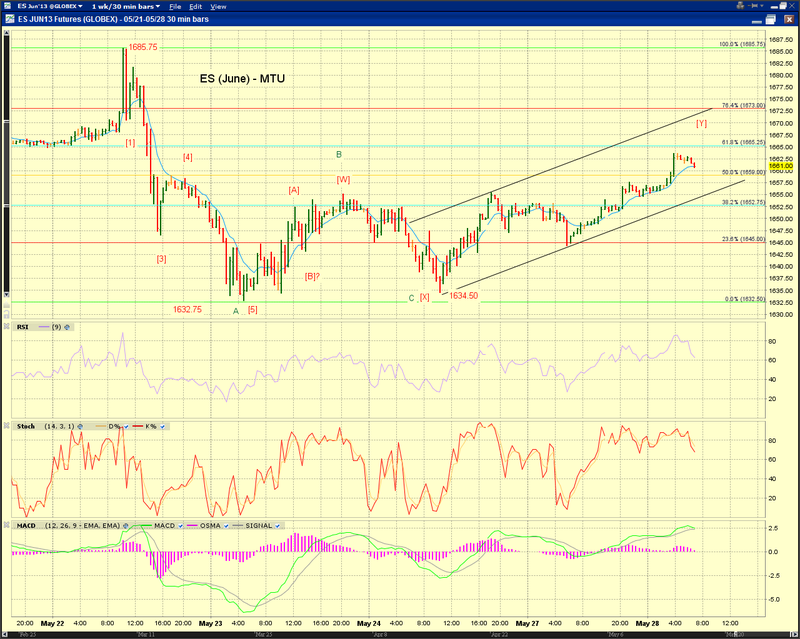 Once the consolidation is over, another [A][B][C] decline is necessary to complete the bear market. Month end. 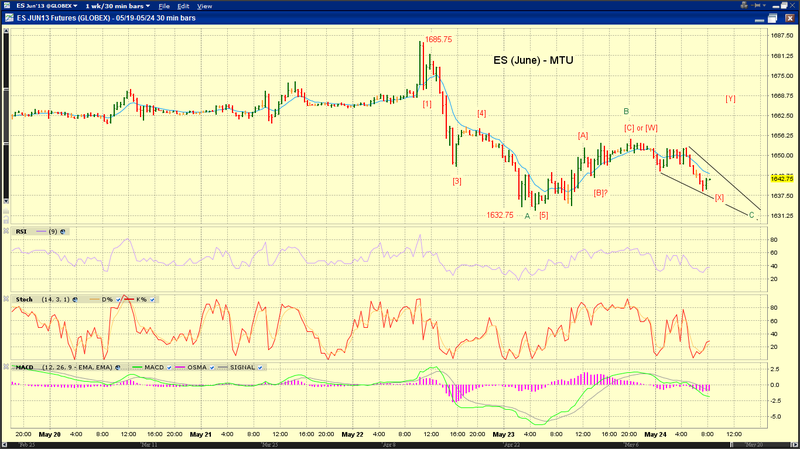 ES testing a 7-day support. See charts. Note the potential small-degree flat (green B) in Chart 2. 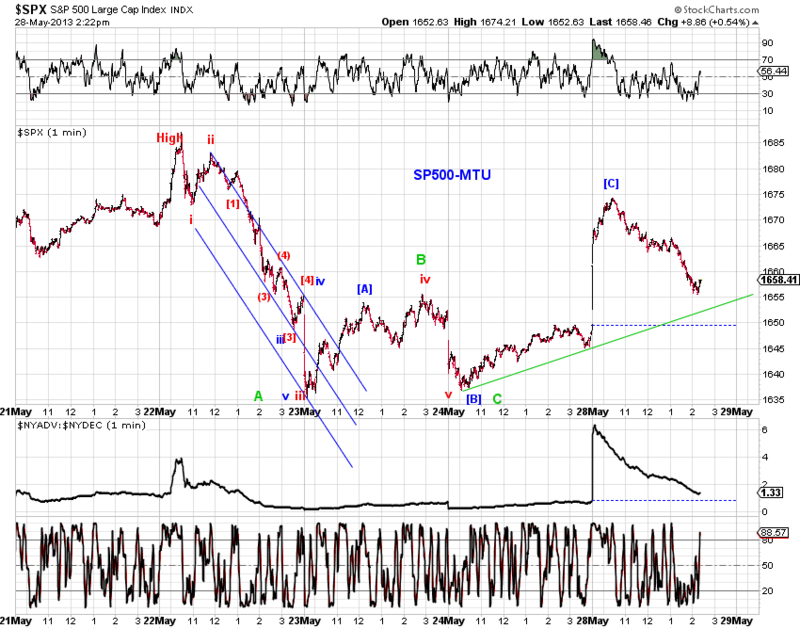 SPX squiggles from its nominal high (Chart 1) and tracking counts since the Nov 2012 low (Chart 2) . 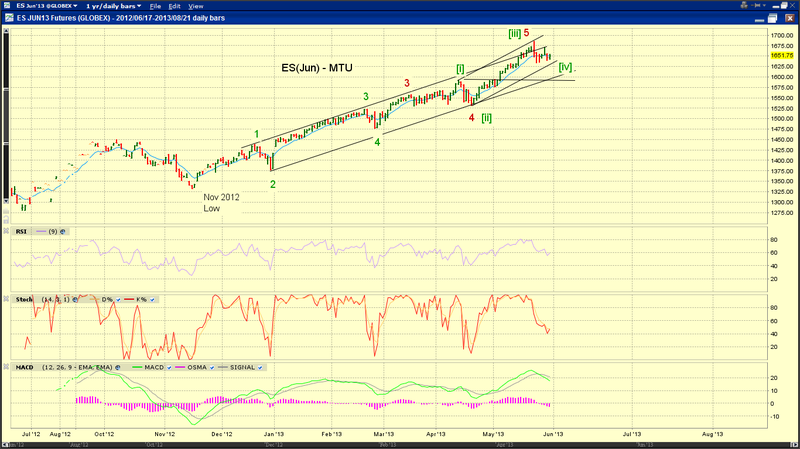 Please see Bull or Bear (5/24/13) for discussions. 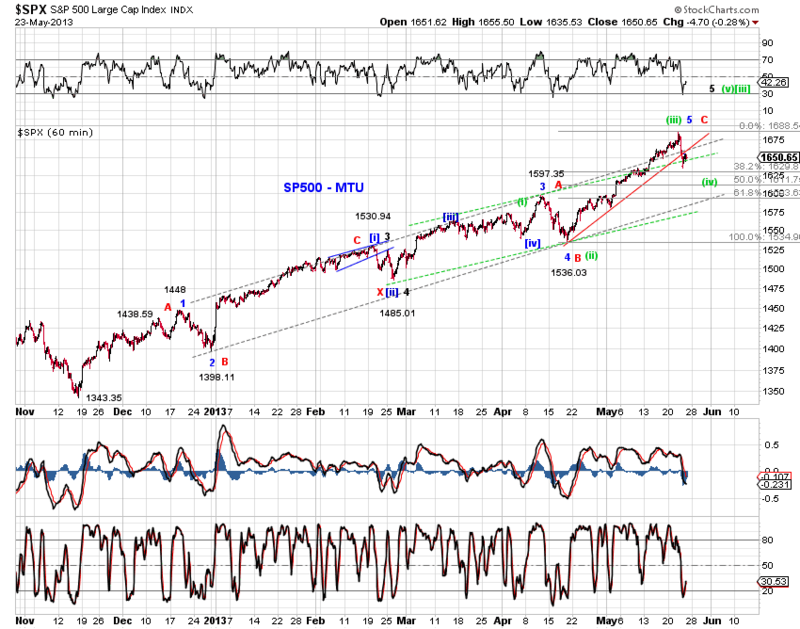 The 9.84% advance in SP500 from its April low (1536.03) is finally over (Chart 1). 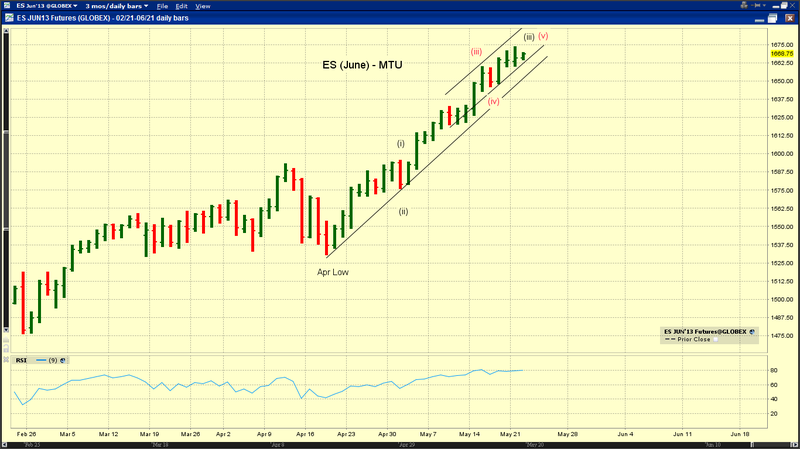 The May high in SP500 (1687.18), a fresh all-time high, is 111 index points or 7% above the 2007 top. In this analysis, we once again attempt to objectively examine whether the rally off the March 2009 low is a bear market rally (albeit a strong one) or a bull market (pullbacks notwithstanding). 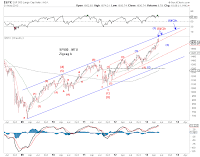 In our view, if the stock market rally since the March 2009 low is a bear market rally, the May high and potentially two more higher wave peaks above the May high likely exhaust probable termination points for the Hope Rally. Any bullish development beyond these future wave peaks would favor a bull-market or effective bull-market interpretation. 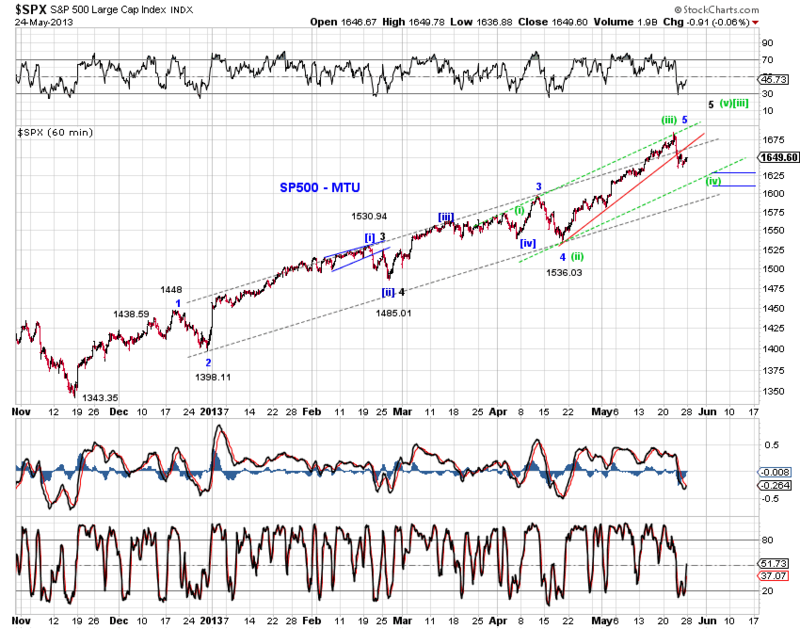 Specifically, the May high can end the Hope Rally. 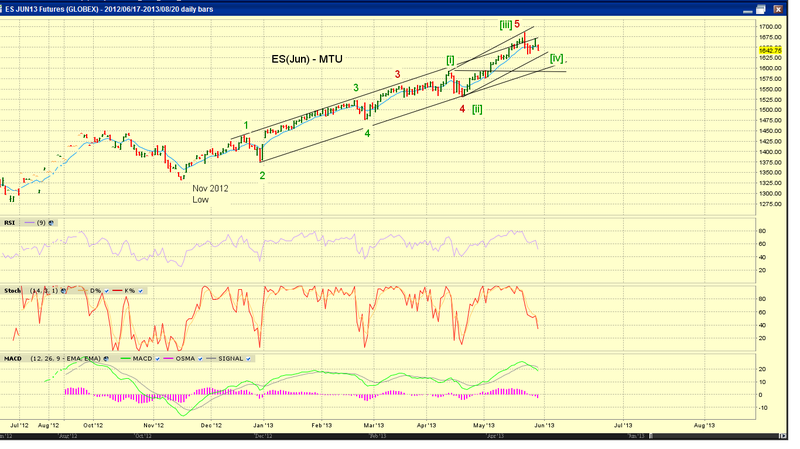 While not required, the advance off the November 2012 low can accommodate another small-degree high above the May high. 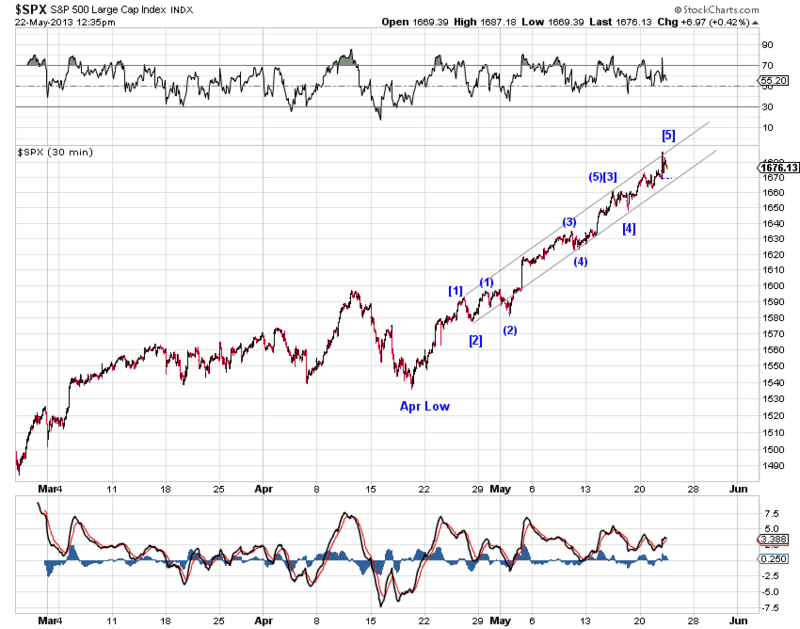 Following a larger pullback, while not required, the advance since the 2011 low can accommodate another high. 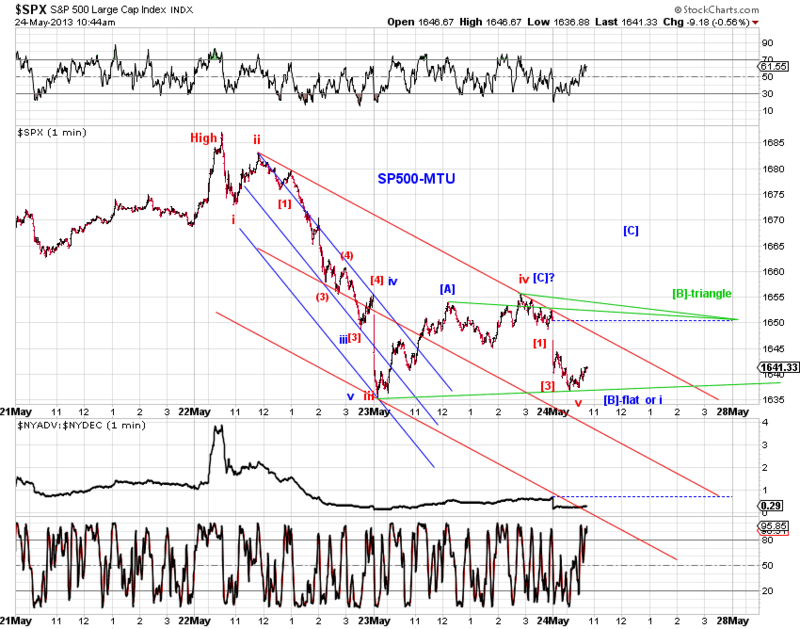 These three highs likely exhaust probable termination points fo the Hope Rally from a bearish perspective. See discussions below. 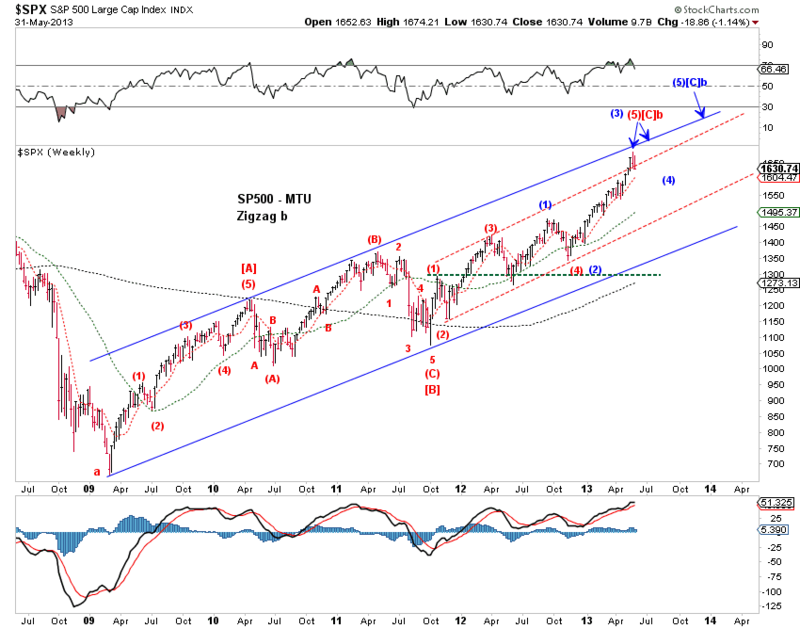 If the rally since the March 2009 low is a bear market rally, it is appealing to count its progress as a simple three-wave zigzag (Chart 2). 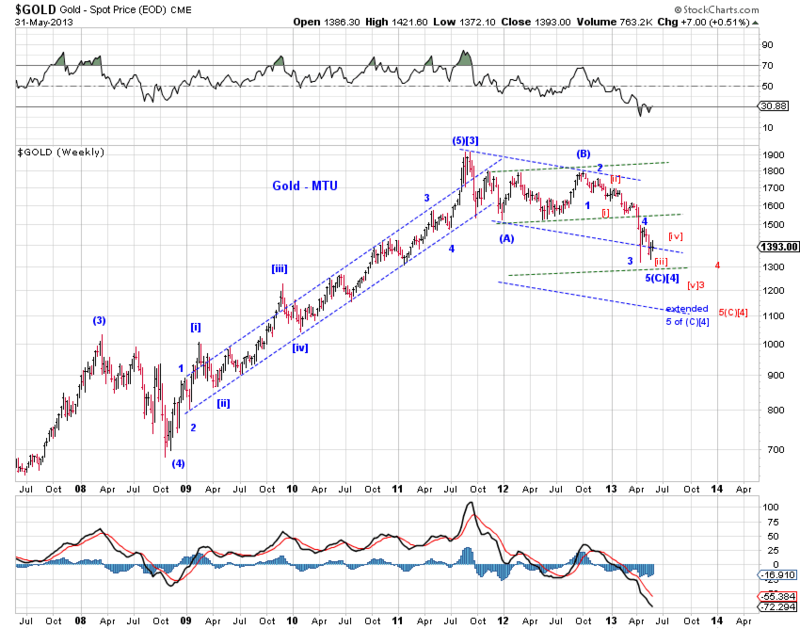 Under this scenario, we label the March 2009 low as cycle wave a and the pending high as cycle wave b. 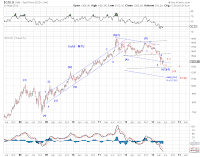 We anticipate a cycle degree wave c decline. 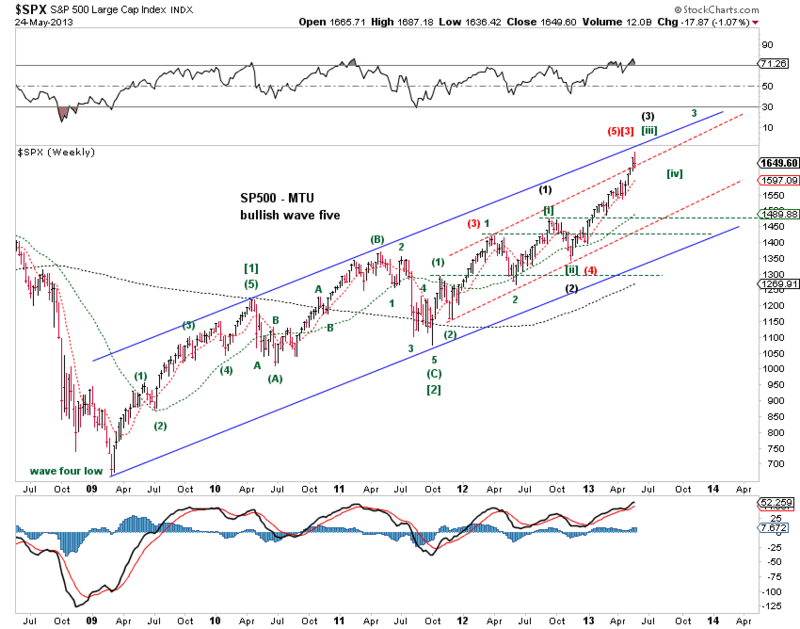 If the March 2009 low marks the end of a wave four correction, the rally since then should be part of a wave five bull market. 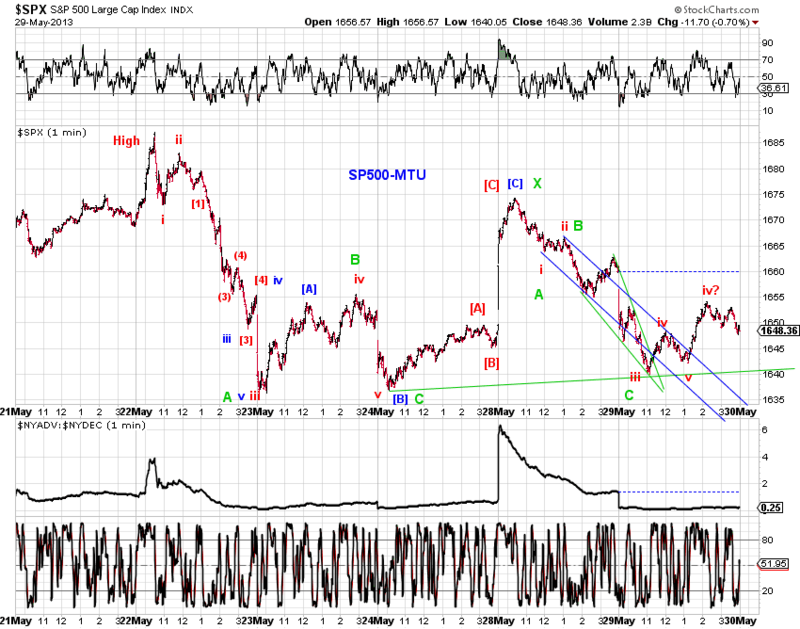 Under this scenario, the proposed three-wave structure can easily be mapped into a larger five-wave impulse wave (Chart 3). Chart 4 updates our tracking counts since the November 2012 low (see Tracking Counts (5/17/13)). 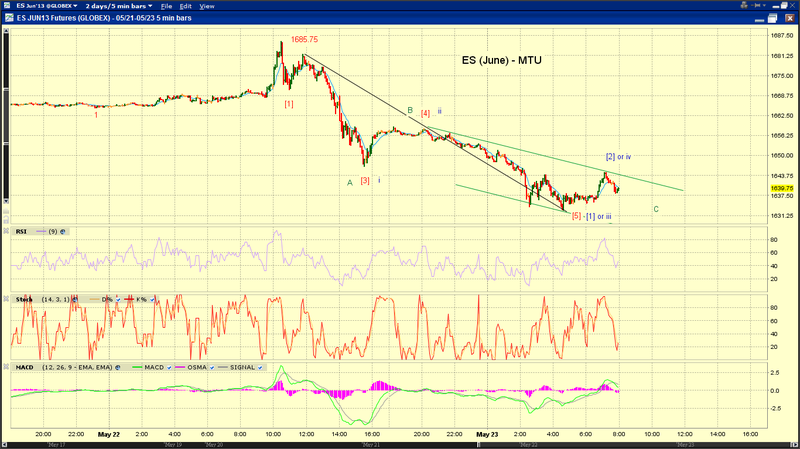 The blue count in Chart 4 shows an extended wave 3, which is preferable, everything else being equal. 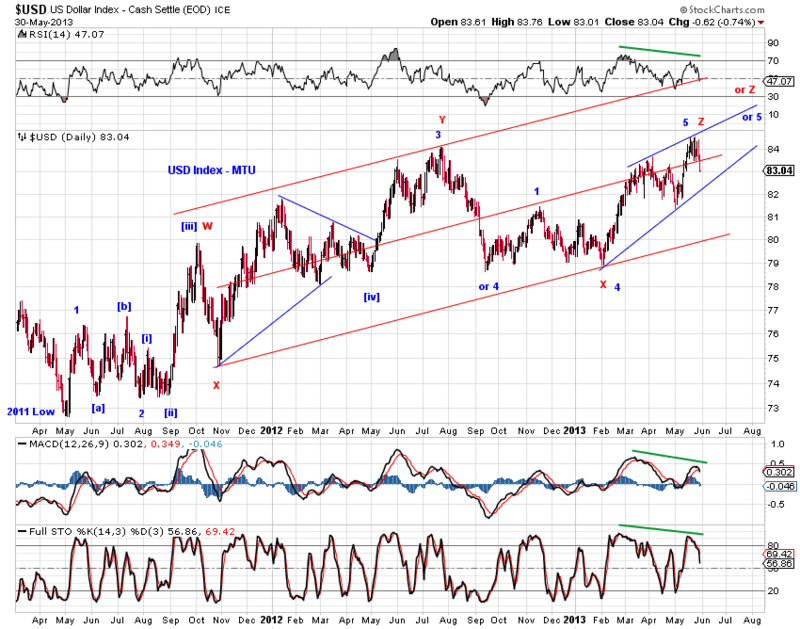 If the Hope Rally has ended, the May high should correspond to the blue 5 in Chart 4, and the red (5)[C]b in Chart 2. 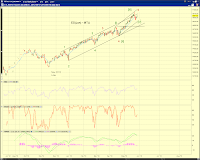 The black count in Chart 4 shows an extended wave 5. 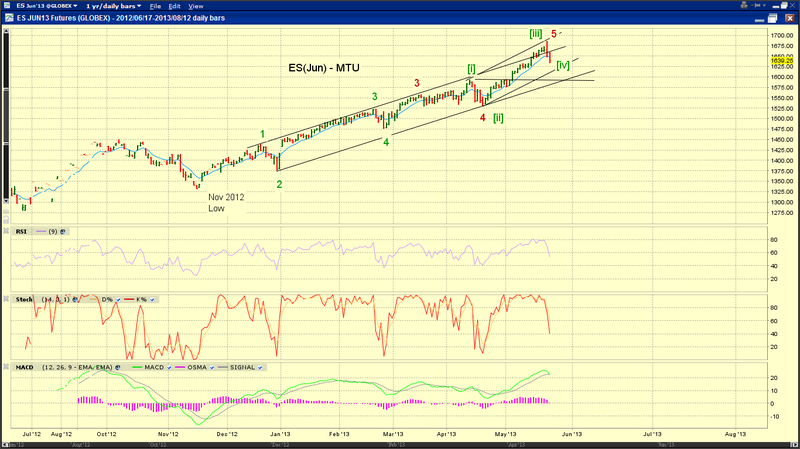 In this case, the May high should correspond to wave [iii] of 5, with the current pullback as wave [iv] of 5. 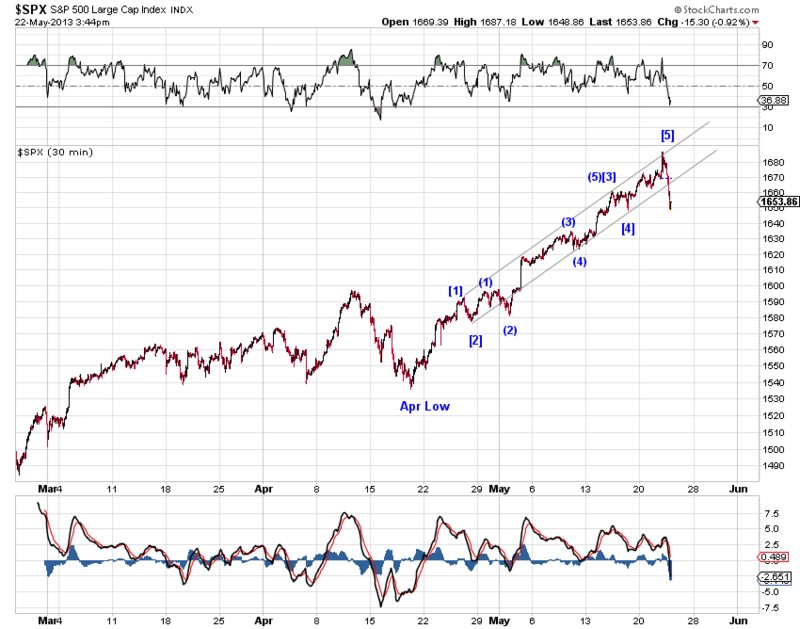 Wave [v] of 5 will push the market to a moderate higher high. 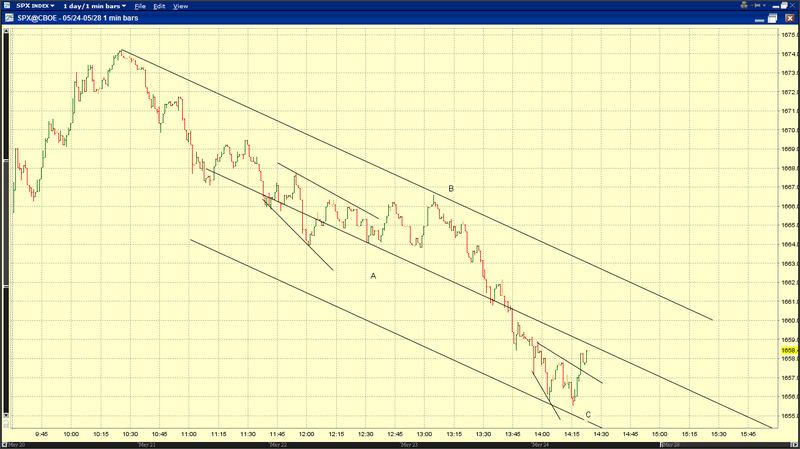 If the Hope Rally ends there, that high should correspond to the black 5 in Chart 4, and the red (5)[C]b in Chart 2. 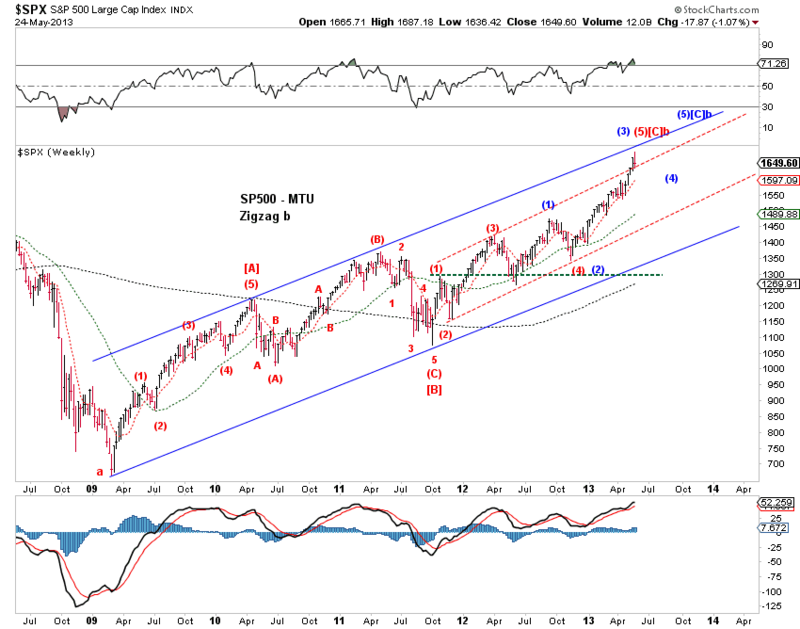 The blue count in Chart 2 suggests that the rally from the November 2012 low is a 3rd wave. 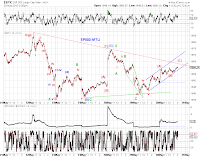 From a technical perspective, it is one of the best trending advances since the March 2009 low. So the strength and the profile of the rally fit those of a 3rd wave. 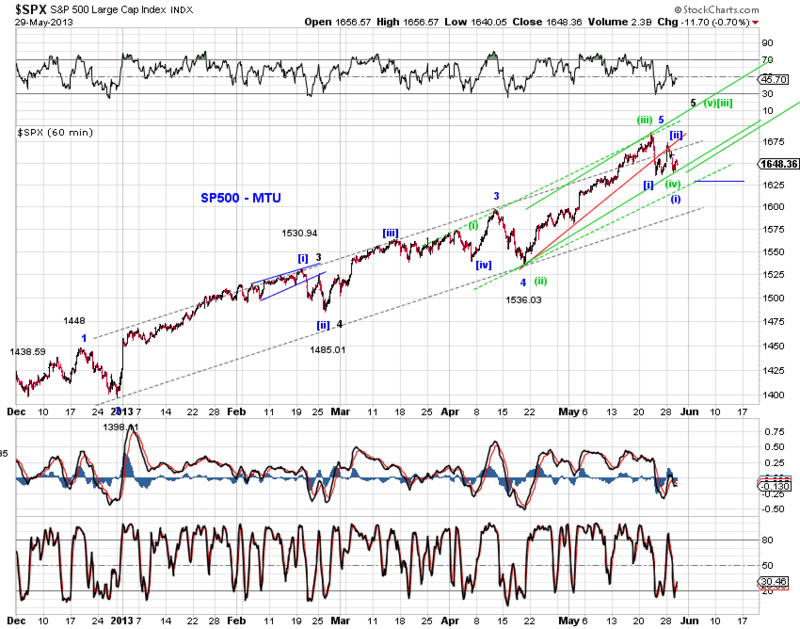 In this scenario, once the blue (3) is in place, a more meaningful pullback (blue (4)) should develop, followed by another high (blue (5)) to conclude the Hope Rally. 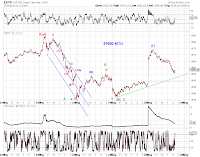 The three potential wave peaks discussed above and labeled as the T-2, T-1 and T-0 peaks, likely exhaust probable termination points for the Hope Rally from a bearish perspective. 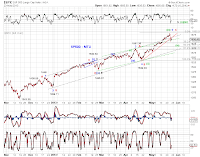 If the market continues to subdivide higher after these three wave peaks, it is logical to emphasize bull-market counts or effective bull-market counts (since some bearish structures allow for much higher upside potential). 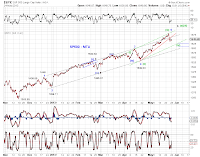 Thus, from a bullish perspective , we present two tracking counts in Chart 3, an extended wave  (green) and a potentially extending wave  (red). [green] The market is approaching the end of wave [iii] of (3) of 3 of . 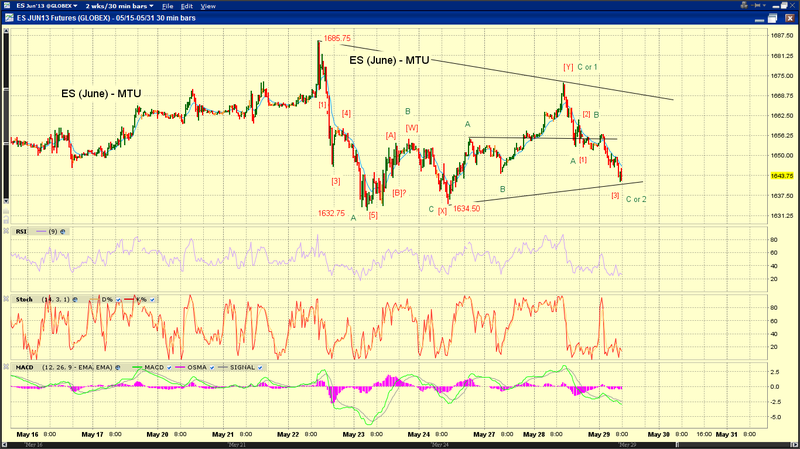 Wave  is extending and should continue to trend up nicely. 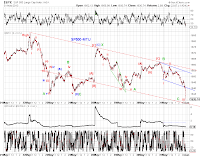 [red] The market is approaching the end of wave  itself. 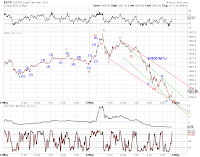 A meaningful wave  pullback is likely. 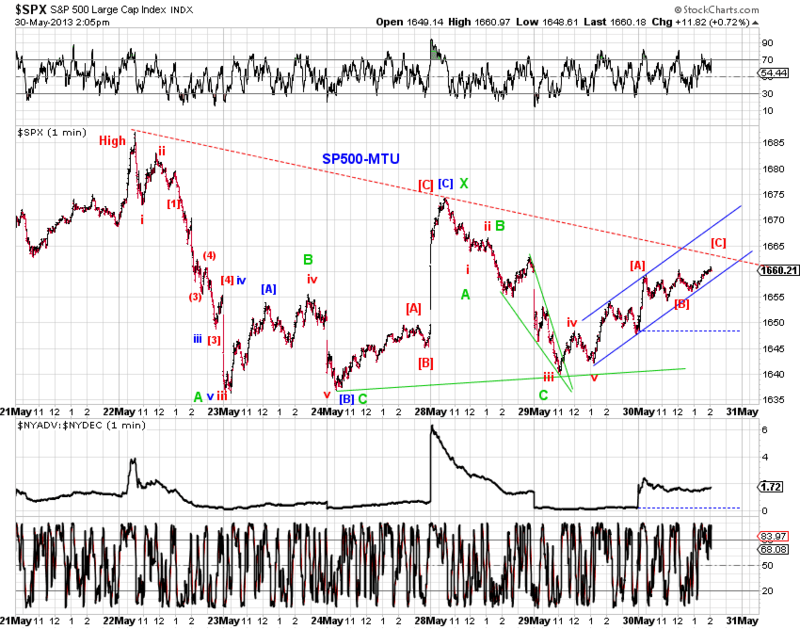 And the subsequent wave  rally could itself extend to achieve the upside potential of the bull market. 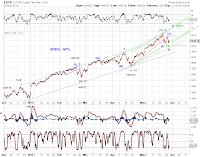 Chart 2 and Chart 3 offer a roadmap regarding where the market is, whether the underlying structure is bullish or bearish. So stay tuned. Tracking counts from the nominal high. See chart. Chart 2 presents squiggle counts from the high. 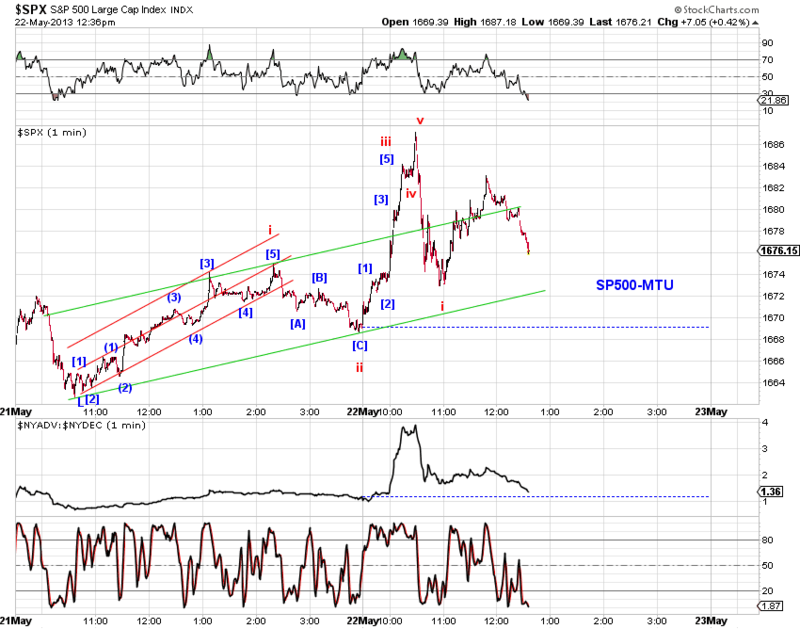 SPX is most likely in wave 2 / wave B rebound and may crawl along the red trend line (Chart 1). Color coded tracking counts from Nov2012 low, April low and yesterday's high. See charts. 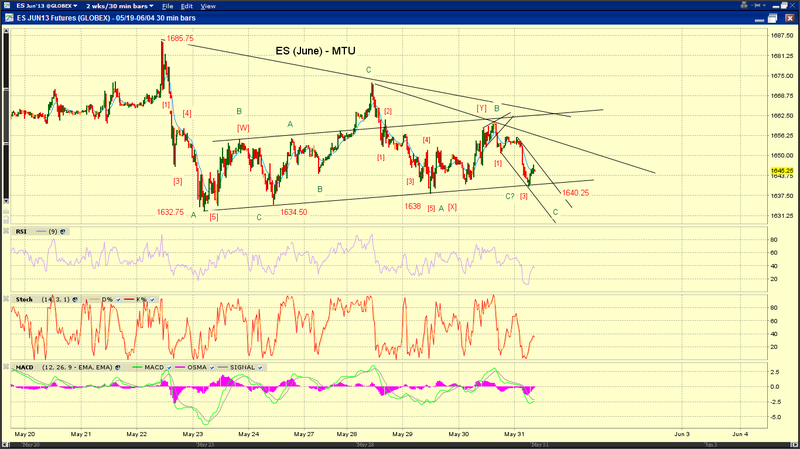 Nov2011 low in chart 1 should read Nov2012 low.